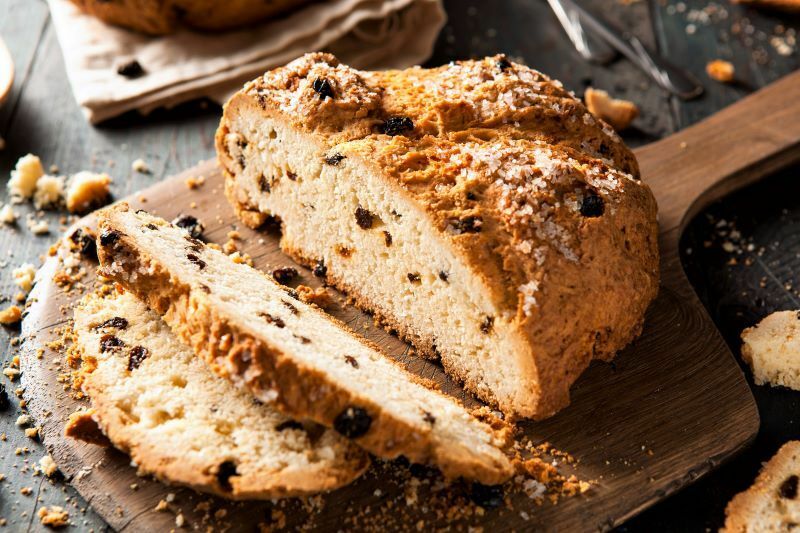 For many, Irish soda bread is simply the taste of home, but the Irish staple recipe is also an international favorite, especially around St. Patrick's Day. The soda bread recipe was first introduced to Ireland during the 1840s. A traditional product of a poor country, soda bread it was made with only the most basic of ingredients: flour, baking soda (instead of yeast), soured milk to moisten and activate the soda, and salt. Perhaps it is the fact that bread-making was so much a part of daily life in Ireland that makes the recipe, the smell, and the taste so special to Irish people. In rural areas, where homes were more isolated, most kitchens had open hearths and the bread would be cooked on griddles or in three-legged black iron pots, over the turf fires. The resulting loaf was tender and dense, with a sour tang and a hard crust. The bread was quite perishable and so every two or three days another loaf would be made and the smell of fresh bread again wafting through the house. Add buttermilk to flour mixture; stir until blended (dough will be sticky). Turn dough out onto a generously floured surface. Knead lightly 4 to 5 times. Shape dough into an 8-inch round loaf; place on a baking sheet coated with cooking spray. Reduce oven temperature to 400 and continue to bake for another 15 minutes, or until loaf sounds hollow when tapped underneath. Cool on a wire rack. Simple and delicious!